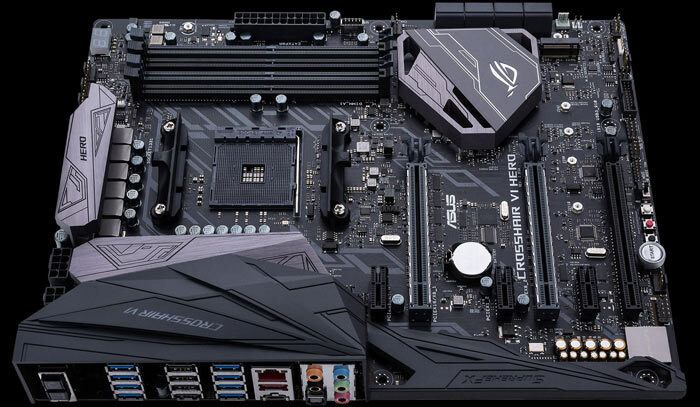 The Asus ROG Crosshair VI Hero is the firm's flagship enthusiast gaming board. This fully featured top of the line motherboard uses AMD's X370 chipset, supports 2-way SLI and CrossFireX (with dual SafeSlot), and is designed for easy CPU overclocking. Cooling considerations feature prominently with Asus Fan Xpert, one 1A header for AIO water coolers, and five more for traditional CPU and system fans, plus liquid cooling enhancements via a flow tachometer and temperature in/out sensors. 'Cutting-edge I/O' is provided on the Crosshair VI with an ultra-fast M.2 slot linked directly to the CPU, and NVMe SSDs being able to take advantage of up to four lanes of PCI Express 3.0. On the back panel you've got handy CMOS clear and flashback switches alongside a bevy of ports including 10Gbps USB 3.1 ports in Type-A and reversible Type-C flavours, Intel Gigabit Ethernet, and SupremeFX S1220 audio I/O. No video I/O is provided as Asus reckons Crosshair VI users will shell out for a dedicated graphics card. For your RGB LED thrills this board supports Asus Aura, with RGB 4-pin header and built-in RGB LEDs in two zones. Asus has this and all the other boards in its buying guide available for pre-order in places like Amazon and Newegg. 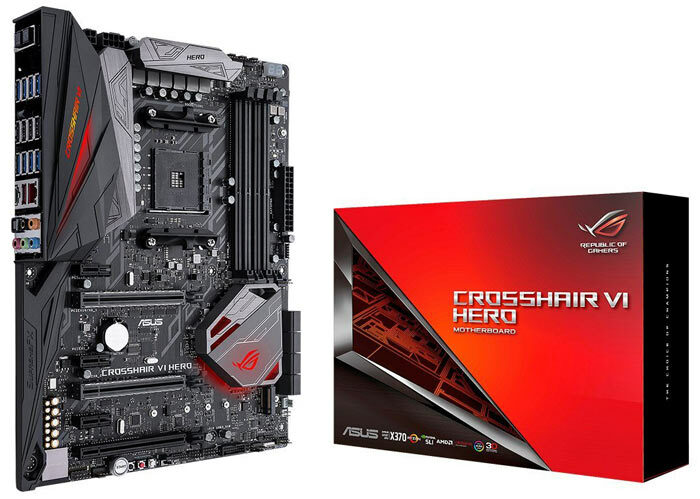 The Asus ROG Crosshair VI Hero has an RRP of US$254.99 and is released on 2nd March. For further reading about this flagship you can head over to the Asus ROG blog where it is featured on its own. The Asus Prime X370 Pro is also aimed at enthusiasts but offers slightly lower spec; smaller heatsinks, lower end built-in audio. However with its DisplayPort and an HDMI port it can be used with AMD's APUs. Stepping down to the next model, the Prime B350M-Plus, this uses the AMD B350 chipset. Check out the table below for an overview of the differences between the AMD chipsets. 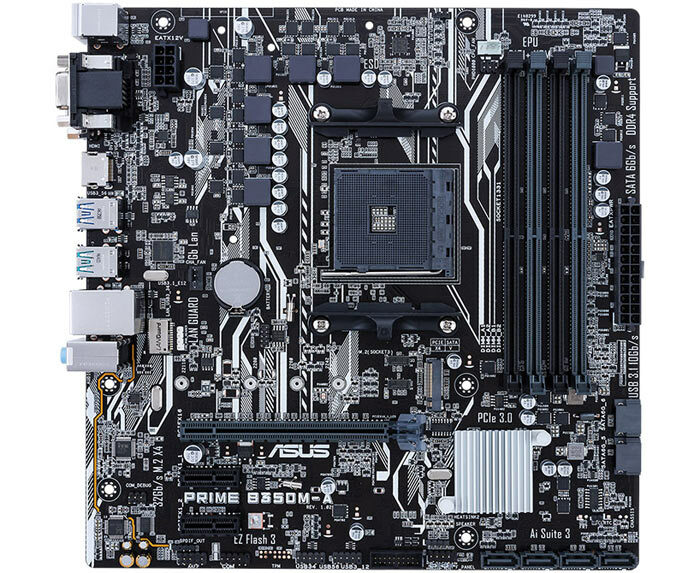 Asus announced just one MicroATX board among the four, and it is the cheapest and most limited option; the Prime B350M-A, pictured above. Though it is still overclocking capable, it has no VRM heatsinks which will likely limit its potential in that area. For your convenience a comparison table with all the four above mentioned motherboards is reproduced below. I kinda want a Ryzen. I just bought a 2700K to replace my 2500 - more for the K rather than the i5 > i7 boost - but more and more things are multicore, and I want to get an up to date system; M.2 SATA, USB 3.1 and the like, and the prices they're talking about are *really* bloomin' tempting. I fully expect there to be one when the full range is revealed. Thanked for using “tickling my pickle” as a descriptor. Damn I love Hexus. On a more relevant note, is it just me or do Asus boards feel a bit boring and generic? Lots of people trust them, they have all the required features, reliable, etc etc., but even their ROG just seems boring to me - all grey, black, red, no interesting designs. Just sharp edges to hurt yourself on. I'm sure people like an understated board with the right colours too, but for Asus' brand I would expect one interesting pick like the Taichi. So far Biostar are the only company who've announced an mATX X370 board AFAIK, and their implementation doesn't support multi GPU (the second physical x16 slot is 2.0 x4, and is shared with one of the other PCIe slots so can drop to x1 depending on how many cards you have plugged in). Hardly surprising tbh - most enthusiasts will go for full ATX, and unless you're intending to support multiGPU in an mATX board there's no compelling reason (that we know of so far, anyway!) to use X370 over B350 in mATX boards - B350 provides plenty of peripheral connection possibilities and supports overclocking. Think that's the first “official” confirmation of ECC support for Ryzen processors! (note, he same listing also confirms that Bristol Ridge APUs don't support ECC).